At the site of the old Municipal Market Building, a new project has brought a vibrant public space to Seattle. Few words send shudders down the preservationist’s spine quite like "parking." In the worst cases, it’s the ultimate demise of a historic site. But there’s a movement underway to turn surface lots into vibrant, lively public spaces in places where they’re needed, and that’s what the city of Seattle and the Pike Place Market Preservation and Development Authority (PDA) have teamed up to do at the newest addition to the historic Pike Place Market site. 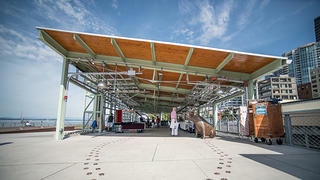 Open since June, the Pike Place MarketFront features new vendor space, low-income senior housing, and three public art installations against the backdrop of the city’s changing waterfront. The complex stands on the site of the old Municipal Market building, which was constructed in the 1920s as a complement to the adjacent Pike Place Market arcade. Both were threatened with demolition in the name of urban renewal in the 1960s, but voters elected to designate the area as a historic district in 1971, saving the structures from the wrecking ball. Just three years late, though, the Municipal Market caught fire, and what was left after the blaze subsided was unsalvageable. Producers Hall has on-site production space for vendors. 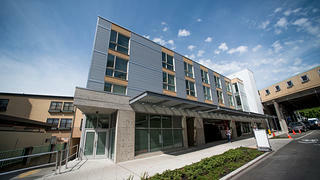 Forty units of low-income senior housing are included. 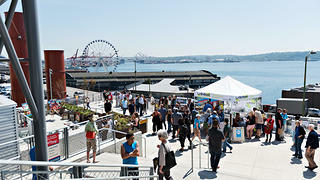 The MarketFront's pavilion has addition vendor space to supplement Pike Place Market. As Pike Place Market grew into the commercial and tourist attraction it is today, the Municipal Market site was left to languish as a parking lot, with remnants of the building’s foundation reminding visitors of what had been there. Now, after a two-year, $74 million project, the space designed by the architects at The Miller Hull Partnership couldn’t be farther from a plot of lifeless asphalt. Western Avenue Senior Housing has helped the city address one of its most pressing concerns around affordability (it also offers artist space in seven of the senior apartments). Meanwhile, the pavilion’s new stalls have alleviated pressure on Pike Place Market, allowing vendors and visitors to interact without the constant crush of people. 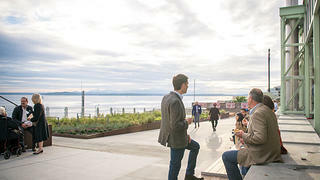 And the 30,000-square-foot public plaza­—with its sweeping views of Puget Sound, Mount Rainier, and the Olympic Mountains—is an early step in connecting the downtown area to Seattle’s waterfront. With the state in the process of removing the Alaskan Way Viaduct, a stretch of highway that divides downtown Seattle and Puget Sound’s Elliott Bay, plans are forming for what will be new attractions and public space at the waterfront. Eventually, the MarketFront "overlook walk" will move people up and down the steep embankment, connecting the two areas. 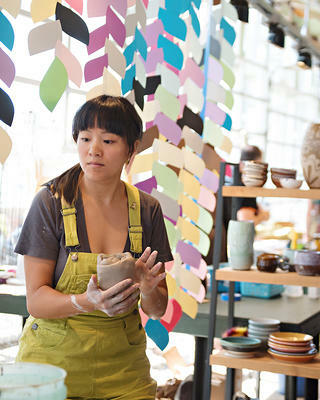 The space has allowed for more interaction between visitors and artisans. 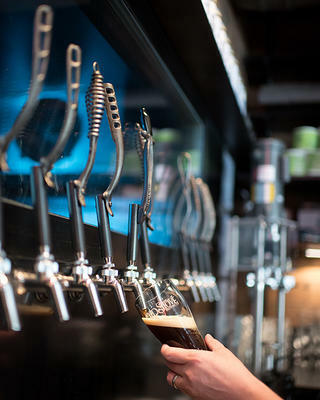 Old Stove Brewing is one of the tenants at Producers Hall. Funding came primarily from the City of Seattle, the state Department of Transportation, and the PDA. 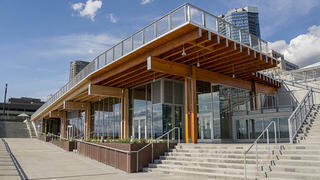 Below the pavilion is the MarketFront’s Producers Hall, with on-site production space for four of the vendors. It leads out on to the plaza, which Crawford says has already become enlivened, attracting sightseeing tourists and office workers enjoying the scenery on their lunch breaks. The new public plaza will eventually connect downtown to Seattle's waterfront. 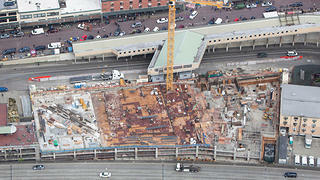 An aerial view of the site under construction. 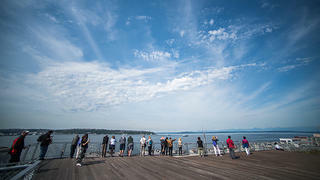 The plaza offers sweeping views of Puget Sound, Mount Rainier, and the Olympic Mountains. The PDA has also tried to honor the site’s history along the way. At the grand opening, Joe Desimone, Jr. —son of one of the Municipal Market’s early managers and owners—read from the proclamation made at Pike Place Market’s 1907 opening. They’re also hoping to add a heritage marker of sorts at the Desimone Bridge, which connected the two markets and still stands. For now, they’ve set an example for how to turn space for vehicles into space for people, creating a vibrant, multi-use public space. “It was really intentional to create a space that was welcoming and accessible to everyone,” Crawford says.